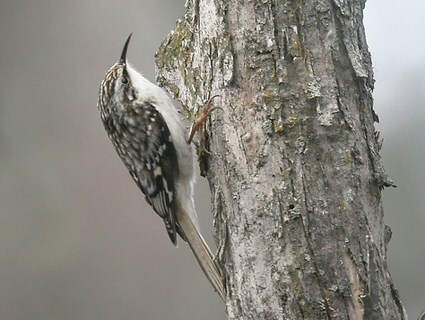 I recently had the pleasure of spotting one of my favorite, but seldom seen, birds of winter, the Brown creeper. It is not a rare bird to be seen but elusive for sure. Every winter I get a few glimpses of a Brown creeper heading up the trunk of a tree where I have a suet feeder. This is the only species that we have that only goes up a tree and never down. It has an unusual way of foraging for food by creeping up a tree and then dropping down to the base of another tree and spiraling up. It’s very interesting to watch. It’s found as an uncommon winter resident statewide October to April. Brown creepers are very small and slim, and quite well camouflaged keeping to trunks of trees. They are brown above and whitish below, with a slender de-curved (downward curve) bill. Like a Carolina wren they have a prominent white eye stripe. Brown creepers are primarily insect eaters but suet seems to be its preferred food at feeders, probably because it is found often on trunks of trees. So, next time we have a little inclement winter weather, that’s when they seem to appear, watch your suet feeder a little more closely. Look for this interesting and elusive little bird. AND…check out the video I recently took of a Pileated woodpecker taking advantage of a water fountain in my yard. It’s always a treat to see this bird and observe its interesting habits and behaviors, not to mention its stunning plumage, but it was especially nice to see it drinking. I had never caught one using one of my water sources before.